Today in Masonic History John Bell is born in 1796. John Bell was an American politician. Bell was born on February 18th, 1796 in the hamlet of Mill Creek, Tennessee. He graduated from Cumberland College, which was later renamed the University of Nashville. He would study law and graduate in 1814. He was admitted to the bar in 1816. In 1817, Bell ran, successfully, for the Tennessee Senate. He would only serve one term. In 1827, Bell ran for United States House of Representatives from Tennessee. A seat which had been vacated by Sam Houston. Despite a hard fought campaign by Bell and his opponent, Bell would prevail largely due to the support he received from the younger vote. Bell served in the House with fellow Tennessee Congressman, James Polk and Davy Crockett. In his second term, Bell would write the Indian Removal Act, it moved the Cherokee and other Indian tribes to Oklahoma along the now infamous Trail of Tears. 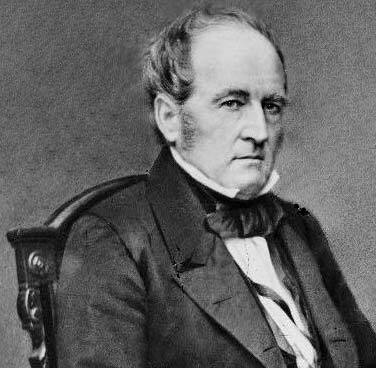 Until his fourth term in Congress, Bell was a supporter of President Andrew Jackson. This was despite being overlooked by Jackson for several positions. Jackson also had supported challengers to Bell's seat in Congress. The final break between the two men came in 1835 when Bell refused to support Martin Van Buren, Jackson's chosen successor. In 1840, Bell supported William Henry Harrison for President. After Harrison was elected, Bell was named the Secretary of War. This drew criticism of Bell since he had in the past campaigned against the "spoils system." When Harrison passed away in office, his successor, John Tyler, kept Harrison's cabinet. Many realized that Tyler would not support the Whig views that Bell and other members of the cabinet held. Their concern was realized just months later in September of 1841, Bell and several other members of the cabinet resigned over Tyler's veto of the Fiscal Corporation bill. In 1861, after the election of President Abraham Lincoln, Bell had several conversation with Lincoln. Bell was opposed to secession and assured Lincoln that he wanted to keep the Union together. After the attack on Fort Sumter, Lincoln had assured Bell he would not use force against the South, Bell felt he was betrayed and began rallying troops in Tennessee to prepare for a federal invasion. He also called on Tennessee to join the Confederacy. Many were stunned by Bell's change of heart regarding the Union. Some referred to his decision as "unspeakable mortification, and disgust, and indignation." Bell passed away on September 10th, 1869. Bell was a member of St. John's Lodge No. 1.